Nobody arrives at the top of success mountain alone. Everyone who has achieved anything of significance has had help along the way from a mentor, coach, parent, teacher or someone who helps guide us along our path. It’s an honor to have executive coach Bill Hart as our special guest for today’s show. 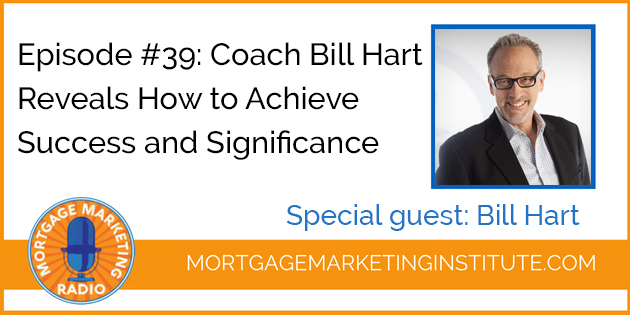 Bill has spent the past 27 years in the real estate and mortgage industries and has been an executive coach with Building Champions since 2003. He’s had literally thousands of coaching sessions and understands what it takes to succeed in any market. In this session, Bill shares his expertise on how to stand out and rise above the noise of a competitive market. Do you want more engagement and response from agents? How about a workable social media plan that attracts your ideal clients? Bill also shares how to adapt your business and marketing plan to align with your unique personality type. You don’t have to be anyone else but you. Being you IS your competitive advantage because your authentic self is what people connect with most. Or, you can leave a rating & review for Mortgage Marketing Radio on iTunes. That way, it helps other professionals discover the show. Finally, you can subscribe on iTunes or Stitcher to get all new episodes when they are released.